Hi there! I cannot find purple sweet potatoes anywhere nearby 🙁 Would adding beet juice to orange sweet potatoes create a vibrant color as well? Thanks! Oh no! Ya, they are tough to find sometimes. I’m really not sure if that would work, but I have to admit it is a brilliant idea. If you try it, let me know how it goes! Hi! Since coming back from the Philippines, I’ve been addicted to ube. Can I use arrowroot powder instead of the tapioca starch? I haven’t tried it, but it should work jsut fine. Those two are pretty interchangable. Hope you love the recipe as much as I do! Can I make any part of the recipe ahead? Crust? Filling? You can definitely make the crust ahead of time! You could probably make the filling ahead of time, too. I haven’t actually tried making that part ahead though so I can’t say 100%. 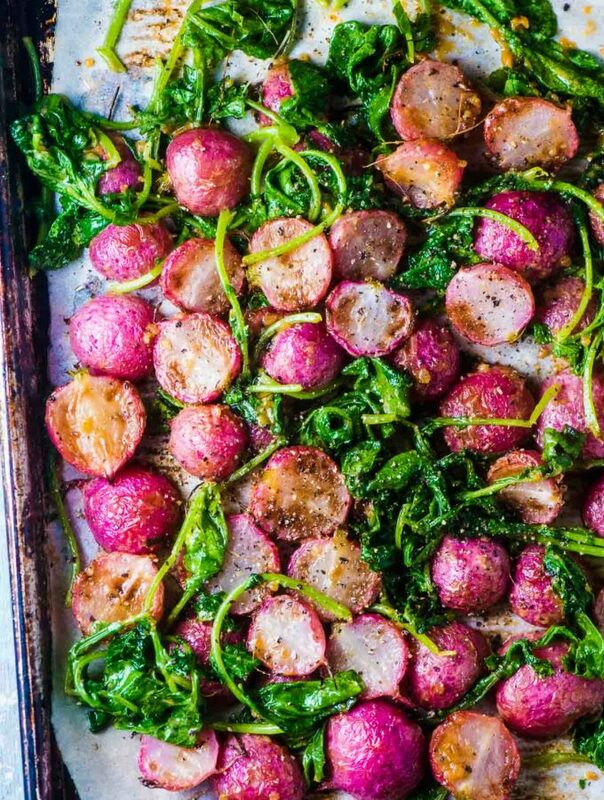 If you baked the whole thing in the morning it will still be great at dinner. Happy thanksgiving! Hi Linda! Yes, the filling is quite thick. 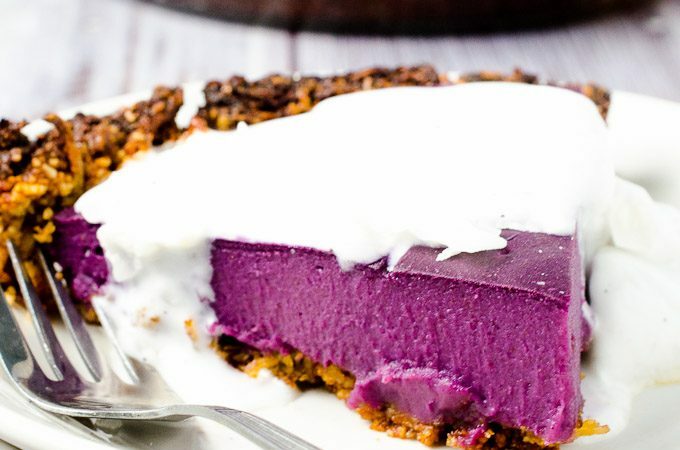 As there are no eggs in this recipe to bind the filling together (like in a traditional sweet potato pie) the extra ube keeps the filling from being runny. Made this tonight as a trial Thanksgiving pie recipe…so delicious! Thank you for this fun recipe. I’m so glad you like it! Yay!! 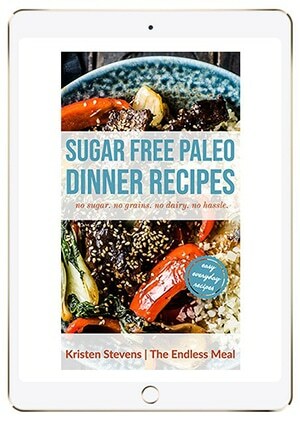 Would this recipe still be standout without the addition of ginger? I am unfortunately allergic, but would love to try this! Made it (for a close cousin) good stuff! One extra I added is a little coconut manna aka coconut butter. Great idea about adding some coconut butter! Mmmm. Love coconut butter!! How much? And did you add to the crust or to the pie filling?? Look at that color!! Gorgeous! That’s a show-stopping dessert! 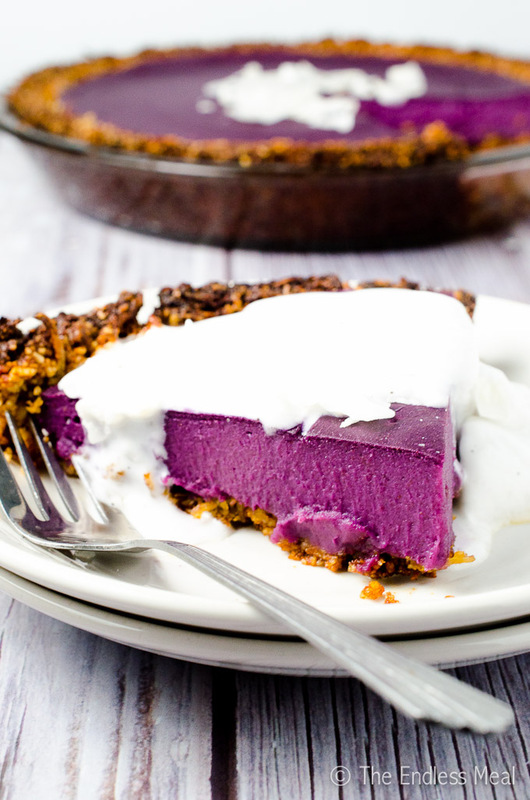 I love purple and I love hidden vegetable desserts so this is going to be a must try for me! Thanks for sharing! Do you think it would change much to bake the ube instead of boil them? This is so beautiful I can’t wait to try it. I so want to try this. This was another one of the first things I saw on your blog that totally caught my eye, and I’m not a sweet potato yam person. IIt’s just so colorful! n this little corner of the world, I’ll not find almond flour, and if I did, it would be priced soooo high. I saw someone else asking you about coconut flour, which I do have. I found another blogger that tells how to use it and make pie crusts and more with it. That said, I tried it for our American thanksgiving and really wasn’t too fond of it. Now, we did have a power outage, so my oven didn’t work and had to use a neighbors. His oven cooks hot and my crust burnt a bit, so maybe it could be useable. Definitely a different texture though, no matter what you make and it does take a “lot” more moisture and eggs. You can make almond flour with almonds and a food processor. The amount of time you process is the difference between almond meal and flour. You store the result in a seal container in the fridge. We just found your recipe via Buzzfeed. And wow! What gorgeous color! We also distribute Stokes Purple Sweet Potatoes that are available in many supermarkets across the country. Maybe we should send some to you to try as well….since it seems to me you like purple food? 🙂 Email me back and I’ll send you some. Thank you! I usually pick up my purple sweet potatoes from the market up the road (and I don’t think you’d be able to ship to Canada) but thank you for the offer. So sweet of you. I haven’t tried leaving it out, but I suspect you could. I would sub equal parts of almond flour instead. I’d love to hear how it goes if you make it! Hi I wanted to know how necessary the shredded coconut is. I generally don’t like the texture of shredded coconut in my desserts and find it over takes the softness of moist desserts. What I mean is that it doesn’t blend in with the recipe and you can taste the pieces. 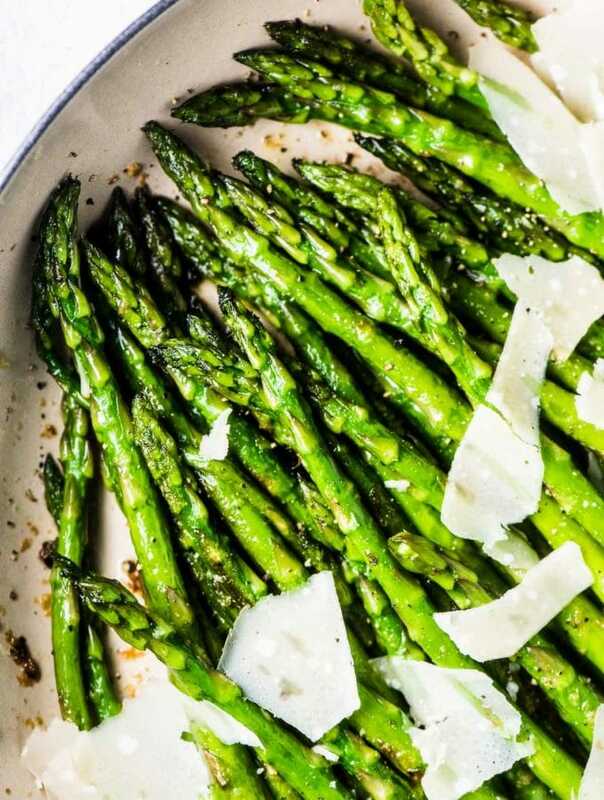 Is it possible to do this recipe without the shredded coconut or will it taste weird or not bond well without it? Or is there a substitute I can use? Or will the shredded coconut texture not be obvious when I taste it? Just to clarify I like coconut flavoured deserts but don’t like the texture of actual coconut. I haven’t tried leaving it out, but I suspect you could. I would sub equal parts of almond flour (almond meal) instead. I’d love to hear how it goes if you make it! I was home sick on thanksgiving & when I was finally hungry I made a sweet potato soup. Had leftover potato & made a mini pie in a tart pan & this was to die for!!!!!!!!!!! I made another today as I had extra filling but had run out of shredded coconut. I wanted to try coconut flour as my mother in law doesn’t like the texture. How much coconut flour should I use? it’s not a one to one ratio with the shredded coconut. Should I add any liquid or more coconut oil & maple syrup?? Pie two days in a row … I love it! Lucky lady! As far as the coconut flour goes, I have to admit that I agree with your mother in law. I’m really not a fan of the texture either so I never use it. I know that it’s not something that can be easily substituted in recipes and it tends to absorb a lot of liquid and turn kinda sawdusty. I’m sorry I can’t be of more help! If you end up experimenting do let us all know how it goes. I’d love to hear the results! this looks beautiful! 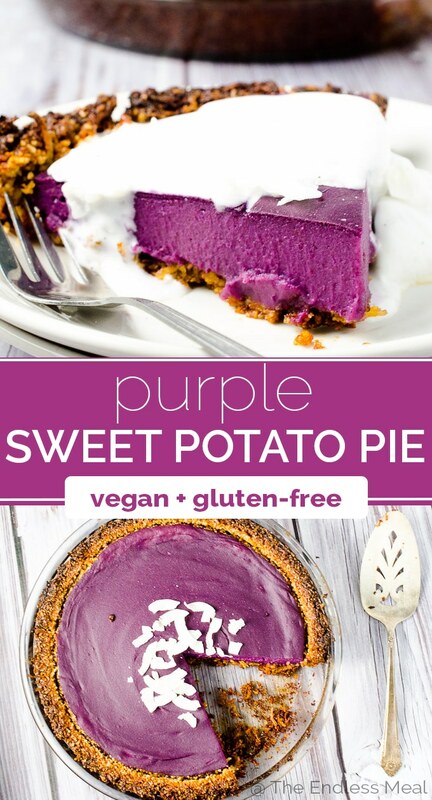 I really hope I can find purple yams so I can make this! Purple is my favorite color! Thanks, Heather! I’ll cross my fingers that you find purple yams! I’m pretty much in your neck of the woods (New West.) and I’ve never seen purple yams…. (although I have to admit I haven’t been looking for them,) Where did you find them? I don’t know the grocery stores in New West very well, but if there is an Asian market close to you I’d start by looking there. Thanks Kristen. If I don’t find them at an Asian Mkt nearby, I will hit T&T the next time I am in Metrotown. I want to make this pie!! uhm, yes please! i just found purple sweet potatoes at my local market! I’m so happy you found them! They’re so sweet and delicious!! This is stunning! 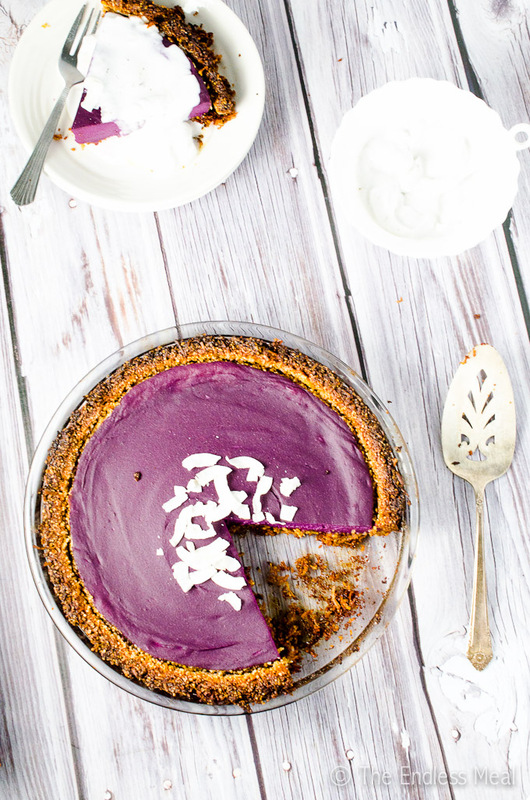 Purple food just makes me so happy and hungry 🙂 I have a purple sweet potato frosting recipe, but I think this is even cooler! Love the color, too bad that I had never seen purple sweet potatoes in Mexico. Maybe will try it with yellow sweet potatoes, but the color will be lost. Pinned! That is too bad! 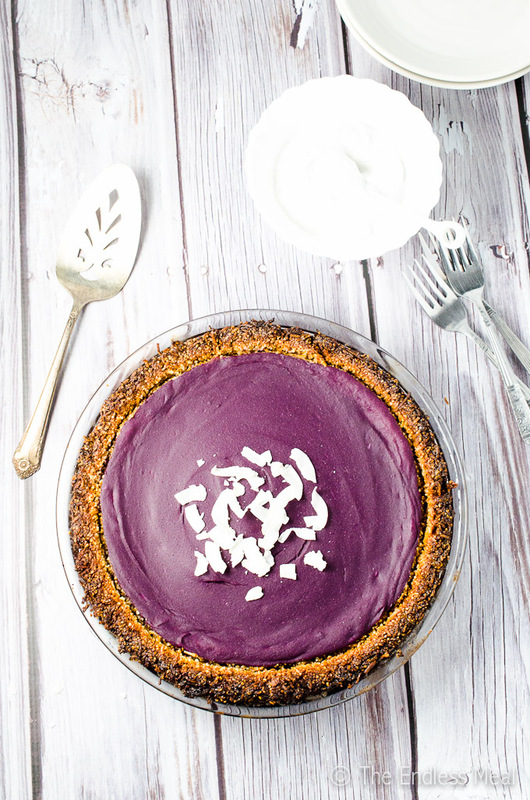 You could definitely sub regular sweet potatoes if you wanted to forgo the colour but keep all the vegan-y, grain-free goodness of this pie. Thanks for the pin! Wow this looks absolutely beautiful. I love the color of the purple yams. I hope I come across some in my area!